As human activities expand beyond national jurisdictions to the high seas, there is increasing need to consider anthropogenic impacts to species that inhabit these waters. The current scarcity of scientific observations of cetaceans in the high seas impedes the assessment of population-level impacts of these activities. This study is directed towards an important management need in the high seas-the development of plausible density estimates to facilitate a quantitative assessment of anthropogenic impacts on cetacean populations in these waters. The U.S. Navy Atlantic Fleet Training and Testing (AFTT) Area extends from a well-surveyed region within the U.S. 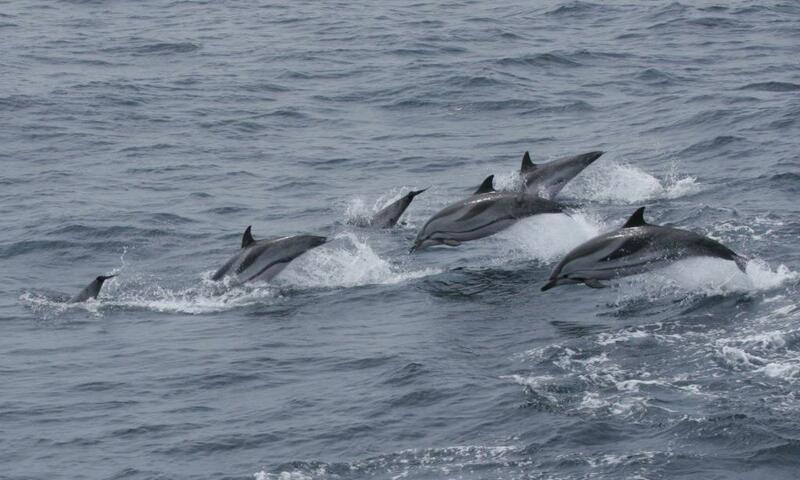 Exclusive Economic Zone into a large region of the western North Atlantic sparsely surveyed for cetaceans. 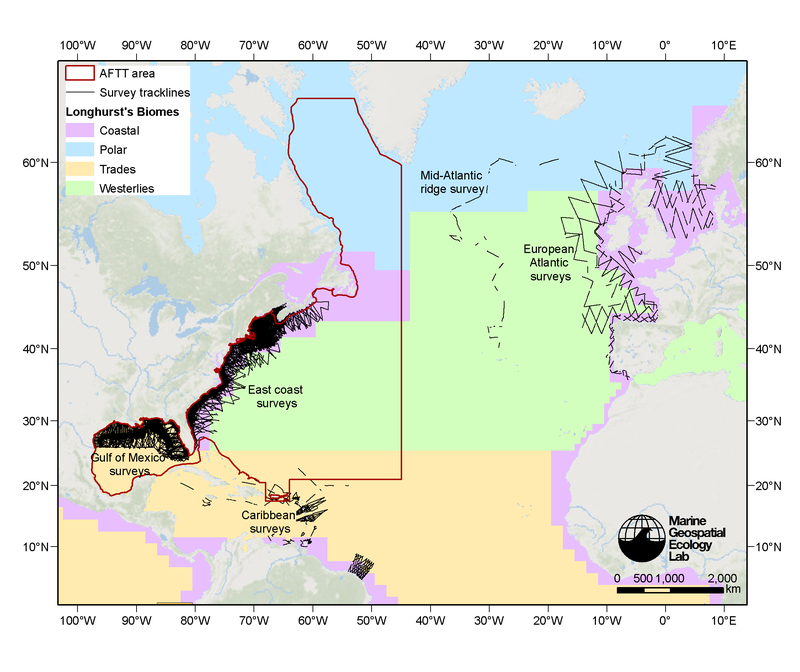 We modeled densities of 15 cetacean taxa using available line transect survey data and habitat covariates and extrapolated predictions to sparsely surveyed regions. We formulated models carefully to reduce the extent of extrapolation beyond covariate ranges, and constrained them to model simple and generalizable relationships. To evaluate confidence in the predictions, we performed several qualitative assessments, such as mapping where predictions were made outside sampled covariate ranges, and comparing them with maps of sightings from a variety of sources that could not be integrated into our models. Our study revealed a range of confidence levels for the model results depending on the taxon and geographic area, and highlights the need for additional surveying in environmentally distinct areas. Combined with their explicit confidence levels and necessary caution, our density estimates can inform a variety of management needs in the high seas, such as the quantification of potential cetacean interactions with military training exercises, shipping, fisheries, deep-sea mining, as well as delineation of areas of special biological significance in international waters. This website allows you to download the density maps for each taxon in GIS-compatible raster format along with maps that estimate the statistical uncertainty in the density estimates. Included with the maps are taxon-specific reports that describe the modeling decisions made for each taxon, provide diagnostic maps, plots, and statistical output, and discuss confidence in the results. These files are © 2015 by the Duke University Marine Geospatial Ecology Laboratory and licensed under a Creative Commons Attribution 4.0 International License. If you use them in a scientific publication or technical report, we kindly request that you cite our journal publication listed above. Download specific results below or all maps, data, and supplemental reports together here (38 MB). First of all, we thank the numerous scientists, observers and crews who collected and shared cetacean observations with us; thank you for the opportunity to analyze the data you produced. Debi Palka, Tim Cole and colleagues contributed the NOAA Northeast Fisheries Science Center surveys. Lance Garrison and colleagues contributed the NOAA Southeast Fisheries Science Center surveys. Amy Whitt, Suzannes Bates, and Gary Buchanan contributed surveys from the New Jersey Department of Environmental Projection Ocean/Wind Power Ecological Baseline Study. Gwen Lockhart contributed the Virginia Aquarium and Marine Science Center surveys. Bill McLellan and colleagues contributed the University of North Carolina Wilmington surveys. Phil Hammond, Claire Lacey and colleagues contributed the Small Cetacean Abundance in the North Sea and Adjacent waters II (SCANS-II) and Cetacean Offshore Distribution and Abundance in the European Atlantic (CODA) surveys. Odd Aksel Bergstad, Thomas de Lange Wenneck, Leif Nøttestad, and Gordon Waring contributed the MAR-ECO survey under the Norwegian License for Open Government data (NLOD). Vincent Ridoux and colleagues contributed surveys from the REcensement des Mammifères marins et autre Mégafaune pélagique par Observation Aérienne (REMMOA) programme. The altimeter products used in this analysis were produced by SSALTO/DUACS and distributed by AVISO, with support from CNES. 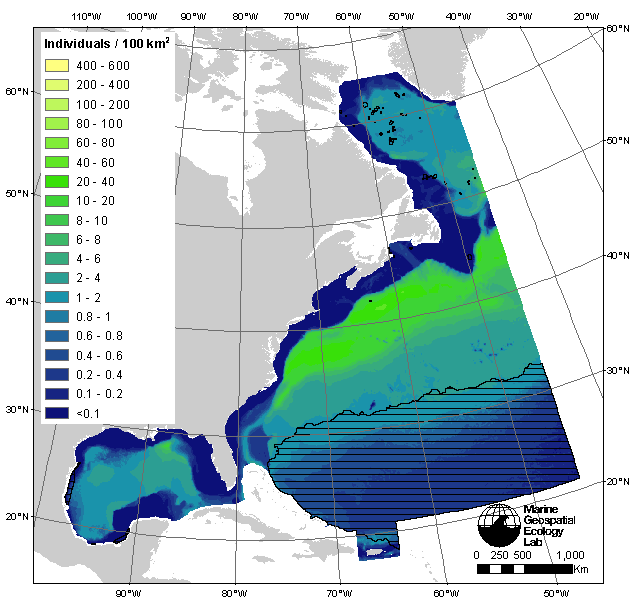 Stéphane Maritorena and Erik Fields contributed satellite chlorophyll data from the Ocean Color MEaSUREs project. Patrick Lehodey, Beatriz Calmettes, and colleagues contributed zooplankton and micronekton results from the Spatial Ecosystem and Population Dynamics Model (SEAPODYM). We thank many colleagues for providing advice and reviewing results, especially Elizabeth Becker, Danielle Cholewiak, Peter Corkeron, Andrew DiMatteo, Megan Ferguson, Karin Forney, Jolie Harrison, Leila Hatch, Dave Johnston, Elizabeth Josephson, Erin LaBrecque, Doug Nowacek, Joel Ortega-Ortiz, Rui Prieto, Andy Read, Denise Risch, Jooke Robbins, Doug Sigourney, Melissa Soldevilla, Joy Stanistreet, Len Thomas, Sofie Van Parijs, and Simon Wood. The third author of this study, David Lawrence Miller, is affiliated with the Centre for Research into Ecological and Environmental Modelling and School of Mathematics and Statistics (University of St Andrews), Woods Hole Oceanographic Institution, and Integrated Statistics. Funding for this study came from the U.S. Fleet Forces Command (cooperative agreement N62470-13-2-8008), NASA (NNX08AK73G) and NOAA/NMFS (EE-133F-14-SE-3558). As acknowledged above, U.S. Navy Fleet Forces Command was one of the funders of this modeling project. The Navy was given the opportunity to suggest spatial, temporal, and taxonomical resolutions and a geographic extent that would facilitate the Navy's use of the results in U.S. environmental regulatory processes. When the analysis was complete, the Navy was given opportunity to view preliminary results. Neither the Navy nor any other funder participated in the analysis of the data or the preparation of the manuscript.